Dr Paul Gerarchi recently visited Vietduk Hospital in Hanoi, Vietnam for an eight-day charity mission with Facing the World. Vietnam is known for its stunning scenery – but this particular trip was far from a tropical holiday. Dr Gerarchi travelled to the centre of Hanoi to the Vietduk Hospital to give life-changing surgery to severely disfigured children. Dr Gerarchi and 15 other specialist surgeons from diverse faculties including Cranio Facial, ENT and Reconstruction made the trip to Hanoi with the group, Facing the World. Facing the World is a UK registered medical charity creating sustainable solutions for children in developing countries who have severe craniofacial defects. 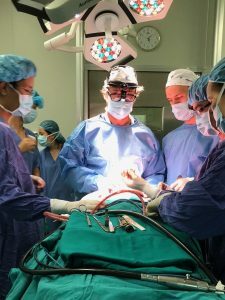 Dr Gerarchi has been involved with UK charity Facing the World for over a decade and this trip to Hanoi marked his tenth trip to the Asian country. He first got involved in the organisation when he was working as a surgeon in London. Dr Gerarchi had his work cut out for him as he averaged around three gruelling surgeries a day. These intensive surgeries could last over four hours, with over eight staff operating on one child at a time. In his short eight-day trip, Dr Gerarchi was involved in and witnessed 130 surgeries. These surgeries ranged from removing small benign growths, comprehensive skull shaping to entire facial reconstructions. As part of their trip, Dr Gerarchi and his peers trained many of the local surgeons, nurses and hospital staff. Their main aim was to improve their knowledge of the array of deformities they may come across, and to expand their precision and efficiency as surgeons and medical staff.